"See One, Do One, Teach One" - I first came across this phrase in Dr.Brett Steenbarger's book, and upon doing a quick Google search, here's a definition I found for this phrase: "A traditional format for acquiring medical skills, based on a 3-step process: visualize, perform, regurgitate". If this form of learning can be applied to something as critical and difficult as medicine, then why not apply it to trading? I bring this up because one of my friends recently asked if I could teach him how to trade, so I spent an afternoon with him going over the price action charts I post on my Blog, and then handed him a copy of Reminiscences of a Stock Operator, which he has almost finished reading. Today he came over to watch/trade the market in real-time at my place, and he performed really well! 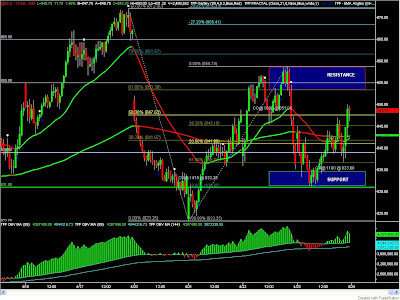 He was able to net +$112.50 in 2 hours trading the ES. 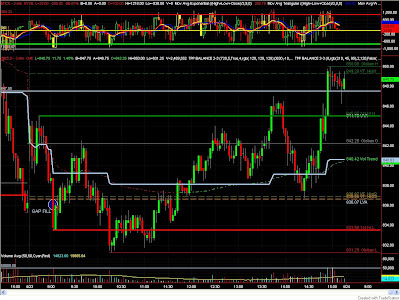 Now keep in mind, today was the first time he ever saw a chart of the ES in real-time, and he got these results armed just with Reminiscences of a Stock Operator and the basics I covered with him in one afternoon (support/resistance, trend, reading price action and identifying higher-highs/higher-lows/lower-highs/lower-lows, and the definition of a candle-stick). That's IT! 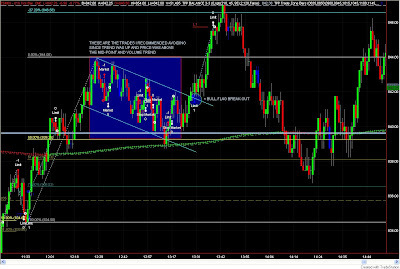 Going over the charts with him in real-time further enforced the trading principles in my own mind. Dr.Brett recommends saying your thoughts aloud because listening to yourself forces the mind to re-analyze the idea, and some ideas "sound" incredibly stupid once you say them aloud. Now he also placed some bad trades, which I recommended him to stay out of, but he wanted to get into them anyway, so for the sake of education (learning from mistakes), I entered him into the trades on Sim, and we promptly lost -$225.00. If we discount the two bad trades, the net profit on the day would be +$337.50. My point is, teaching someone else how to trade will probably make you a better trader (+1 for karma, I suppose). So lets share knowledge and become better traders. Durable Goods Orders out at 7:30 AM (central) and New Home Sales data out at 9:00 AM (central) tomorrow morning. Aside from that, the 830 level held today so that's a good sign for the bulls. I'm hoping for continued movement to the up-side. ES 15-Minute - Price above 34 and 200 EMA. 830 level held. You said, "...(support/resistance, trend, reading price action and identifying higher-highs/higher-lows/lower-highs/lower-lows, and the definition of a candle-stick). That's IT!". It's about the same with me in daytrading the YM, at least the concept is. BTW, I upgraded to TS v. 8.4, build 1693. I was warned by others about v. 8.5 and 8.6 to stay away from them. The idea of sharing info with others to help each other become better is a good idea. I've knocked it around for a while (2 yrs. trading the YM). The problem I always have is that I only want to trade my plan, not somebody else's, so the problem is I (you) need others who trade exactly like you do, in order to get better yourself. Otherwise I (you) will end up with countless techniques that will only create confusion. Getting the shotgun approach like this may be good for someone just starting out who doesn't have a plan yet. But not so much for someone who wants to get better with a already well-entrenched plan. I get the impression you already have a plan. I wrestle with this idea every time I think I ought to start a blog myself. The answer I usually give myself is "why? ", unless its a Don Miller type blog where the "how-to" of trading is not really open to discussion. Trading is thus a solitary sport for me and most others who want to get better, but only so long as it improves on the exact plan we already have. Trading is not so much about the plan, as it is about the execution of the plan. The idea of "accountability partners" is good whereas two or three people all trading the exact smae method apply 2-3 sets of eyes to the chart to see if anyone is missing something, or not acting when they should be. I like that idea. But then again, we are all different and each puts his own spin on a method and 2 people rarely end up with the same trading plan. Oh well. Hard to believe I even posted this as I get ready to re-analyze Fridays YM chart. Have a good weekend. EP - great post! I've actually been thinking a lot about this very topic this weekend so I was pleasantly surprised to see you post about it. I too have had a lot of friends/family inquire about my trading and at first I actually had a selfish attitude about and thought "I've spend hundreds of hours learning this the 'hard way' so I'm not about to give it all away." Fortunately, I realized this was a stupid way of thinking before I had held the thought for too long and I decided it is better to share what you know rather than hide it. I definitely agree that the teacher receives just as much benefit, if not even more than the student. And besides, trading really is an art when it comes right down to the actual execution and no two traders will trade even the same plan identically. So in short, I totally agree with you, we should be willing to part with our knowledge and in doing so, we will become better traders ourselves. Hi Chuck, thanks for stopping by!. I agree that no two traders will trade exactly alike. But I still think there's value in bouncing ideas off other traders, so long as they trade similar time-frames. For example, I'm a short-term intra-day trader so I would benefit discussing day trading with others who day trade as well. I'm sure I would gain useful knowledge from swing and position traders too, but the most relevant knowledge would probably come from other day traders. Of course the trading plans can be different; but perhaps we can teach each other a more efficient risk management strategy or share some insight that helps us view our own method(s) in a new light. You said "...Otherwise I (you) will end up with countless techniques that will only create confusion." I believe this will only happen if you lack clarity in your existing method. When speaking with other traders, your own plan has to be solid enough so that you don't start changing what isn't broken. I think I'm finally getting to the point where someone else's opinion/bias won't have a big effect on my own. That wasn't the case a few months ago. Back then if I was in a Long position, and another trader was short, it would cause a lot of doubt in my mind. That's no longer the case. So I agree with your point, but again, if someone else's method/opinion is effecting my trading, that in itself is an indicator that my plan is not solid enough. In my friend's case, he has no prior market knowledge or experience, and I'm teaching him my method. He's also doing outside reading, and I'm sure he will mold the method to make it his own over time. But by sharing my knowledge, I'm probably saving him at least a year's worth of research/education and confusion. In doing so, I'm further crystallizing the concepts in my own mind. The teacher also benefits from the questions that are asked during the teaching process. Stan, right on brutha! My only advice would be to make sure the person REALLY wants to learn how to trade, so you're not wasting your time. For example, I gave my friend the Reminiscences book, and he finished reading it in three days. That alone shows me he has real interest in the subject. I'm not going to waste my time teaching someone who isn't passionate about trading.